The 2017 NCAA Division I Men's Basketball Tournament involved 68 teams playing in a single-elimination tournament to determine the men's National Collegiate Athletic Association (NCAA) Division I college basketball national champion for the 2016–17 season. The 79th edition of the tournament began on March 14, 2017, and concluded with the championship game on April 3 at University of Phoenix Stadium in Glendale, Arizona. The championship game was the first to be contested in a Western state since 1995 when Seattle was the host of the Final Four for that year. In the Final Four, North Carolina beat Oregon (making their first Final Four appearance since 1939) while Gonzaga defeated South Carolina (both making their first ever Final Four appearance). North Carolina then defeated Gonzaga 71–65 to win the national championship. A total of 68 teams entered the 2017 tournament, with all 32 conference tournament winners receiving an automatic bid. The Ivy League, which previously granted its automatic tournament bid to its regular season champion, hosted a postseason tournament to determine a conference champion for the first time. In previous years, had the Ivy League had two schools tied for first in the standings, a one-game playoff (or series as was the case in the 2002 season) determined the automatic bid. On March 10, 2016, the Ivy League's council of presidents approved a four-team tournament where the top four teams in the regular season would play on March 11 and 12 at Philadelphia's Palestra. The remaining 36 teams received "at-large" bids which are extended by the NCAA Selection Committee. On January 24, 2016, the NCAA announced that the Selection Committee would, for the first time, unveil in-season rankings of the top four teams in each division on February 11, 2017. Eight teams—the four lowest-seeded automatic qualifiers and the four lowest-seeded at-large teams—played in the First Four (the successor to what had been known as "play-in games" through the 2010 tournament). The winners of these games advanced to the main draw of the tournament. The Selection Committee also seeded the entire field from 1 to 68. The committee's selections resulted in two historic milestones. The Northwestern Wildcats of the Big Ten Conference made their first-ever NCAA Tournament in school history, officially becoming the last "power conference" school to make the tournament. (This fact is ironic considering that Northwestern hosted the first-ever NCAA Tournament in 1939). The Wildcats' First Round opponent, the Vanderbilt Commodores of the Southeastern Conference, also made history: with a record of 19-15, they set the mark for the most ever losses for an at-large team in tournament history. Four conference champions also made their first NCAA appearances: North Dakota (Big Sky Conference), UC Davis (Big West Conference), Jacksonville State (Ohio Valley Conference), and first-year Division I school Northern Kentucky (Horizon League). Note: Greensboro, North Carolina was originally awarded First and Second round games, but the games were relocated to Greenville, South Carolina due to NCAA objections over HB2. 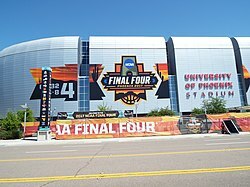 The city of Glendale, a Phoenix suburb, became the 30th host city, and the University of Phoenix Stadium became the 39th host venue, to host a Final Four. For the second straight year, no regional games were held in domed stadiums, a move dictated in 2013 by the NCAA to limit use of the stadiums for the regional rounds. The tournament featured two new arenas in previously visited markets. For the first time the tournament was held at the Bankers Life Fieldhouse, the home of the Indiana Pacers. This marks the first time since 1982 that a venue other than the RCA Dome or Lucas Oil Stadium hosted games within the city of Indianapolis. It also became the fifth venue within the city to host games, temporarily tying Indianapolis with Houston for the most different venues used within a city; Houston will add a sixth venue when the Toyota Center hosts games in the 2020 tournament. The tournament also returned to Sacramento, moving to the brand new Golden 1 Center, home of the Sacramento Kings, replacing Sleep Train Arena as the city's primary indoor sports venue. The 2017 tournament marked the last time that the Bradley Center will be used for tournament games, as it is being replaced by the Fiserv Forum in late 2018. The new Fiserv Forum is scheduled to host the tournament in 2022. The tournament also saw a shift in location of first round games from Greensboro, North Carolina to Greenville, South Carolina. Greensboro originally was awarded First and Second Round games, but the games were relocated due to NCAA objections over North Carolina's passage of HB2. This was also the first time a South Carolina venue hosted the tournament in 15 years, after the state removed the Confederate battle flag from the South Carolina State House grounds in July 2015 and the NCAA implemented a policy of not hosting championship games in the state in response to the display in 2002. Eight teams, out of 351 in Division I, were ineligible to participate in the 2017 tournament due to failing to meet APR requirements, self-imposed postseason bans, or reclassification from a lower division. [n 1] Hawaii had previously been banned from entering the tournament as a penalty for infractions, but the NCAA later reversed its ban. The following 32 teams were automatic qualifiers for the 2017 NCAA field by virtue of winning their conference's automatic bid. The "Record" column includes wins in the First Four for the Big 12, Big West, NEC, and Pac-12 conferences and losses in the First Four for the ACC and Big East conferences. The MEAC and Southland each had one representative, both eliminated in the First Four with a record of 0–1. The America East, Atlantic Sun, Big Sky, Big South, CAA, Horizon, Ivy League, MAAC, MAC, Mountain West, Ohio Valley, Patriot, Southern, Summit, Sun Belt, SWAC, and WAC conferences each had one representative, eliminated in the First Round with a record of 0–1. CBS Sports and Turner Sports held joint U.S. television broadcast rights to the Tournament under the NCAA March Madness brand. As part of a cycle beginning in 2016, CBS held rights to the Final Four and championship game. As CBS did not want its audience to be diffused across multiple outlets, there were no localized "Team Stream" telecasts of the Final Four or championship games on Turner channels as in previous years. Following criticism of the two-hour format of the 2016 edition, the Selection Sunday broadcast was shortened to 90 minutes. CBS Sports executive Harold Bryant promised that the unveiling of the bracket would be conducted in an "efficient" manner, and leave more time to discuss and preview the tournament. Kellogg called the First Four (Tuesday) with Webber doing the First, Second and Regionals. Westwood One had exclusive radio rights to the entire tournament. For the first time in the history of the tournament, broadcasts of the Final Four and championship game were available in Spanish. ^ Woo, Jeremy. "UNC holds off Oregon, to face Gonzaga in final". SI.com. Retrieved May 5, 2017. ^ "Final Four 2017: Gonzaga holds on to beat South Carolina, advances to title game". CBSSports.com. Retrieved May 5, 2017. ^ Schonbrun, Zach (April 4, 2017). "North Carolina Stops Gonzaga, Turning Heartbreak Into Joy". The New York Times. ISSN 0362-4331. Retrieved May 5, 2017. ^ "The Ivy League Adds Men's, Women's Basketball Tournaments Beginning in 2017" (Press release). Ivy League. March 10, 2016. Archived from the original on March 11, 2016. Retrieved March 3, 2017. ^ Auerbach, Nicole (January 24, 2017). "Midseason March Madness sneak preview should bring positive buzz". USA Today. Retrieved March 3, 2017. ^ "March Madness bracket: How the 68 teams are selected for the Division I Men's Basketball Tournament". National Collegiate Athletic Association. February 18, 2016. Retrieved March 3, 2017. ^ "2016-18 preliminary rounds". NCAA. November 14, 2014. ^ Katz, Andy. "3-point shot: UConn gets APR on track". ESPN.com. Retrieved February 23, 2018. ^ "Division I student-athletes still making gains in APR". NCAA. April 20, 2016. ^ "University of Northern Colorado imposed penalties on itself over NCAA violations". Denver Post. The Associated Press. October 8, 2016. Retrieved February 28, 2017. ^ "CSUN admits violations in men's basketball program, self-imposes postseason ban". Los Angeles Times. January 8, 2016. Retrieved February 28, 2017. ^ "Multidivision and Reclassifying for 2015–16" (PDF). NCAA. Retrieved February 27, 2016. ^ "Former Hawaii head men's basketball coach violated NCAA ethical conduct rules". NCAA. December 22, 2015. ^ "Hawaii men's basketball eligible for postseason after Committee on Infractions reconsideration". NCAA. March 3, 2017. ^ "March Madness 2017: Conference tournament scores, schedule, NCAA tournament automatic qualifiers". NCAA. February 20, 2017. Retrieved February 28, 2017. ^ a b c d e Andrew Astleford (March 26, 2017). "South Carolina, Florida dominate All-East Region team". SECCountry.com. Retrieved March 26, 2017. ^ a b c d e Thorpe, Jacob (March 25, 2017). "Johnathan Williams was the Best in the West". The Spokesman-Review. Spokane, Washington. Retrieved March 26, 2017. ^ a b c d e Shane Keyser (March 25, 2017). "KU's Frank Mason and Josh Jackson make NCAA All-Midwest Regional team". Kansas City Star. Retrieved March 26, 2017. ^ a b c d e Jerry Tipton (March 26, 2017). "Fox on UK's foul trouble: 'I'm not blaming the officials, man'". Lexington Herald-Leader. Retrieved March 27, 2017. ^ a b c d e "Joel Berry named Final Four Most Outstanding Player". theScore.com. April 4, 2017. Retrieved April 5, 2017. ^ "CBS Sports, Turner Sports announce programming schedule for 2014, 2015". National Collegiate Athletic Association. May 7, 2013. Retrieved April 1, 2015. ^ "CBS Sports and Turner Sports Announce 2016 NCAA Division I Men's Basketball Championship Commentator Team". NCAA. March 8, 2016. Retrieved March 9, 2016. ^ "March Madness: Jim Nantz, Grant Hill, Casey Stern and Debbie Antonelli highlight March Madness Commentator Teams". NCAA. March 2, 2017. Retrieved March 2, 2017. ^ a b Maiman, Beth (March 8, 2017). "March Madness TV schedule: How to watch and live stream every game in the NCAA men's basketball tournament". NCAA. Retrieved March 9, 2017. ^ "Media Circus: Breaking down CBS and Turner's March Madness broadcast package". Sports Illustrated. March 12, 2017. Retrieved March 13, 2017. ^ "CBS cuts bloated Selection Sunday show to 90 minutes from two hours". Sporting News. March 7, 2017. Retrieved March 8, 2017. ^ "Westwood One and the NCAA make history with first Spanish language audio call of NCAA Men's Final Four". NCAA. February 28, 2017. Retrieved March 1, 2017.